Emory President James Wagner (far right) answers a question at the 2015 Employee Council Town Hall. Panelists also included (left to right) S. Wright Caughman, Woodruff Health Sciences Center CEO and executive vice president for health affairs; Rich Mendola, interim executive vice president for business and administration; and Claire Sterk, provost and executive vice president for academic affairs. The full 2015 Town Hall meeting, including their presentations, can be viewed online. 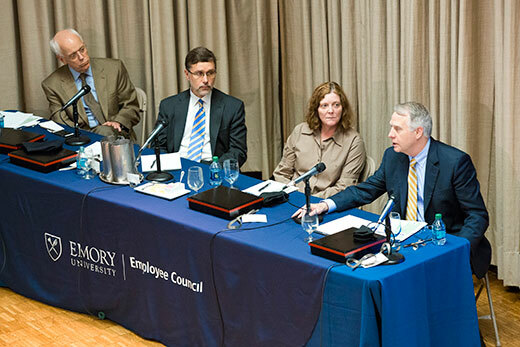 Emory's values of "excellence, integrity and optimism" were on full display at this year's Employee Council Town Hall, an annual tradition giving Emory employees an opportunity to ask questions of the university's top leadership. Incoming Employee Council President Linda Jackson set the tone for the April 15 meeting by reading the winning submission from the Council's essay contest, written by Gerald Coleman, a supervisor in the building and residential services of Campus Services. His heartfelt essay praised the "boldness of a new vision" in his department. With the "mantra of 'Do the right thing, do it the right way, do it for the right reasons,' … our organization is definitely reaching new heights with our new mission vision," wrote Coleman, whose essay will be posted on the Employee Council website. Coleman's essay proved an apt introduction for later remarks from Emory University President James Wagner, who noted that last year he asked the Town Hall audience about what is good at Emory. This year, he asked, "What are the practices of supporting working community at Emory that, first, we must never, ever lose and, second, that we should put in place or do better?" He listed three values — excellence, optimism and integrity — for which the university strives, and illustrated how all three supported Emory's critical role in treating patients with Ebola virus disease. Emory University Hospital's serious communicable disease unit, in partnership with the U.S. Centers for Disease Control and Prevention, had trained for years to respond to a highly communicable disease, "so there was optimism that Emory could care and care safely for these patients," Wagner said. "And the integrity component was that we never promised we could do more than just that." "Emory's excellence is changing the way other people do things," Wagner added, noting that Emory has shared its Ebola treatment protocols with the world. "These values of excellence, integrity and optimism play out in the policies, practices and customs of what we do as employees at Emory University." A key component of the Town Hall is an extensive question-and-answer session, where employees can ask questions about any subject directly to university leaders. In addition to Wagner, panelists included Claire Sterk, provost and executive vice president for academic affairs; Rich Mendola, interim executive vice president for business and administration; and S. Wright Caughman, Woodruff Health Sciences Center CEO and executive vice president for health affairs. Other administrators were also on hand to answer questions related to their departments. In his introduction, Wagner had joked, "I hope we don't talk about parking too much," noting that the floor was open to "anything you want to talk about." And unlike in previous years, there was only one transportation-related question: A patron of the Executive Park shuttle said the recent route change no longer dropped off patients at the front door of the Orthopaedics and Spine Clinic, instead requiring them to walk two blocks. Lisa Underwood, associate vice president for business and finance in Campus Services, oversees transportation and parking. She responded that the route change was made after some departments moved to Executive Park "so we could best meet the needs of Emory staff and Emory patients there," and said she would investigate what this shuttle patron is experiencing. Many of the questions centered on issues of inclusion and access. The first question was about a proposed increase in the number of international students: "What does that look like? How will you go about doing that? What are some of the benchmarks and numbers that you try to meet?" Wagner noted that back in 1995, when Emory began its 10-year strategic plan that concludes this year, "we had fewer than eight percent of students in our undergraduate body [who] were international, passport-carrying students. At that time, we thought that it wasn't enough to give the students a sense of what it means to be in a global community." After making a concerted effort to reach a 12 percent goal, "we found that Emory had been 'discovered' and we are now running between 16 and 17 percent and that's probably a good place for us," he said. Now Emory is looking to refine that mix of international students by evening out the groupings of international students and offering new kinds of scholarship and financial aid to ensure the university is getting those countries' best students. Wagner listed two reasons to have strong international representation: so that students here have a sense of global community and so that Emory's impact can also be global. "Imagine that if we can get some of the very best students from around the world and even if they don't stay in the U.S. and they go back and they take positions of influence in these countries … we will have had a significant global impact," he said. Sterk noted that Emory's new global strategy "includes not only emphasizing students who come from abroad to the United States but also the experiences that many of our students have going abroad." In answer to a question about Emory's challenges in having a group of undocumented students on campus, Wagner said the university's efforts are directed toward undocumented students who have a legal standing here under the federal Deferred Action for Childhood Arrivals (DACA). "All Emory is doing is saying is that's a small number of students and principle is more important," he said. "For a DACA student, we will try to make up a financial aid package substituting non-government institutional dollars for the government dollars that they otherwise could have qualified for." Peter Barnes, vice president of human resources, fielded questions about the Emory Credit Union and paid parental leave. Asked if the credit union would consider reopening the Grady campus branch, Barnes responded that he would bring that up to the credit union board. Regarding paid parental leave, Barnes said, "We have prioritized that as one of our potential benefits from our worklife executive committee." "We like to have benefits that have the greatest benefit to the largest number of people with a reasonable cost. So that would be one of the factors that would be in our prioritization for paid parental leave," he said, noting that the issue will be presented to the University Senate. A concern was raised about staff members, such as those in housekeeping and maintenance, who do not always have access to computers. Is there a designated area for them to send emails if they have questions so they can receive information and updates? "[Campus Services] is aware that a lot of the workforce is out in the field so they're not connected to a workstation. We do have different areas around campus where they can and do log in," Underwood said. Eric Bymaster, associate vice president of finance, administration, and operations, listed a number of places where staff could use computer kiosks, including Dobbs University Center, in the library and other places with public computers for access. "We've also encouraged HR to provide communications that are not solely electronic — to reach out with pamphlets, flyers and written documentation — and share that with Campus Services as well as our animal caretakers at Yerkes and other locations as well," he said. Council President Anita Yarbrough added a new segment to this year's Town Hall by inviting University Senate President Kathryn Yount and Student Government Association (SGA) President Jon Darby to describe the missions of their organizations and update the audience on their latest work. Bymaster, who is chairing the Class and Labor Implementation Committee of the University Senate, also gave information about that group's work.